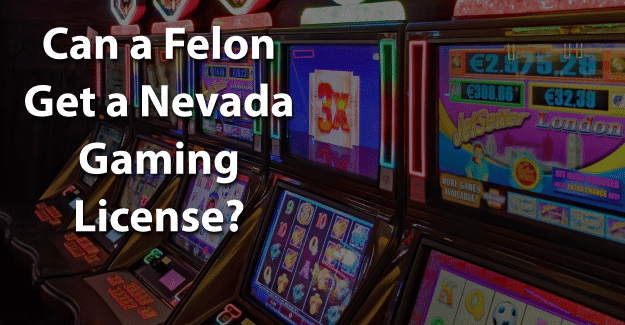 Can a Felon Get a Nevada Gaming License? While there are many employers who will hire felons, a lot of positions remain unavailable to felons even though felons make good employees. Those with experience or interest in gaming may consider getting a gaming license if they live in the state of Nevada. This blog post will address the question of whether or not a felon can get a Nevada gaming license. What is a Nevada Gaming License? The first level is for employees who are required to register. The licensing process is typically simple, involving a brief application, a fingerprint card, and a fee. The focus is on the person’s criminal history. The second level is for employees and others in the gaming industry who must register and undergo a more extensive review because of their positions. The third level is a restricted gaming licensing for specific locations. These are for locations with fewer than 15 slot machines that are not essential to the business. An applicant must complete an involved application. At this level, there will be a thorough criminal background investigation for all applicants. A non-restricted gaming license is required for owners of casinos and other places with more than 15 slot machines. This is true for any owner who holds at least 10% of the company. Officers of the company including the president, CEO, accounting officer, and secretary must also be licensed. The reason for the background investigation is to provide the gaming commission the necessary information to determine if a candidate is suitable for a gaming license. The application is then passed on to the Nevada Gaming Control Board that investigates the provided information. This team of investigators includes background and financial agents. An applicant will be required to meet with the agents who will review the application for correctness and completeness. The background investigation will review civil lawsuits and criminal charges for at least the last 10 years. The background information investigation will check the applicant’s police record. In addition, the applicant’s business and personal assets and business methods will be reviewed. Schools and universities are contacted to verify education. Military information is also verified along with marital status. Investigation of financial records allows investigators to look at the applicant’s resources and sources for any business funding sources. Following the investigation, a final interview is typically held with the applicant. This is to obtain answers to any remaining questions, inform the applicant of any areas of concern, and to provide the applicant and his or her legal counsel the application status. It’s important to be honest when applying for a Nevada gaming license. If a felony isn’t disclosed but is found on a background check, this constitutes fraud and is punishable. It is a crime to falsify any application, which could result in being sent back to prison. Having their record expunged can give them the chance needed to begin with a clean record and to succeed in getting a gaming license. Expunging a criminal record allows anyone to honestly state on an application that he or she has not been convicted of a crime. It’s a significant challenge, but it might be worth it for a felon that wants to get a Nevada gaming license. Having his or her record expunged and also documenting any training programs, rehabilitation, or additional education could make the essential difference in a felon succeeding in obtaining a gaming license. Another aid is having support from family, friends, or previous employers. A felon doesn’t have to be defined by his or her crime. What defines us is not our mistakes but how we recover from them. Beginning again and living an honest life no matter how difficult it might seem can be accomplished. What do you think about this blog post? Have you or someone you know been in the situation of trying to get a Nevada gaming license with a felony? What was that like for him or her, and how did he or she achieve success? Please tell us in the comments below.